Alvechurch are back in the promotion race after an end-of-year dip in form. 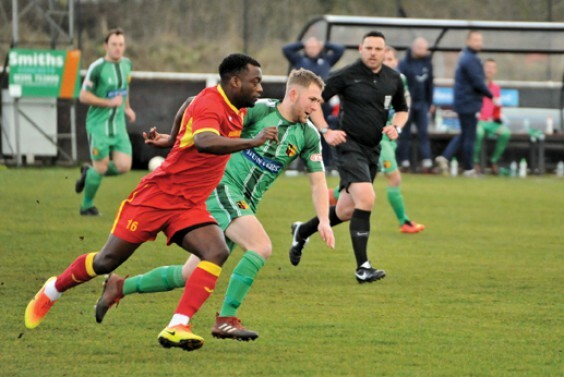 A mixed bag of results in December and early January saw Alvechurch slip out of the play-off places, but they soon recovered their form and were back to seventh in the league as we went to press, with games in hand over some of their rivals. After a win at Royston, with new signing Lee Chilton scoring his debut goal, 2018 ended with two defeats – firstly to Redditch United, who claimed the local bragging rights on Boxing Day with a deserved 4–2 victory. However, Andre Landell’s 25-yard strike was voted goal of the month and despite the defeat, the goal will live long in the Alvechurch supporters’ memory. The final game of the year was a disappointing 3-0 home defeat to Tamworth, which was followed by a 3–1 away loss to Banbury on New Year’s Day. However, fortunes began to pick up with a 1-0 win at Stratford, another 1–0 against Halesowen Town, and an excellent 3–0 away win against St Neots (notable in that both teams had their captains sent off), featuring two goals from Lee Chilton. The twice-postponed home encounter with Leiston was due to take place on Jan 29. * In an initiative between Birmingham City FC and local non-league clubs, three under-18 Blues players are to join Alvechurch. The idea is for the players to mingle with the AFC first team players, travel to away games and gain matchday experience. The three players are central midfielder and defender Tate Campbell, Nick Okoro, a winger who can also play as an out-and-out forward, and George Baker, a right-sided full back or midfield player. Everyone at Lye Meadow hopes their stay at the club will be beneficial and enjoyable. * There have been several recent changes concerning the goalkeeping position. Matt Sargeant has now left the club, to be replaced by experienced goalkeeper Danny Crane. Danny previously played for Rushden & Diamonds in the EFL, and has also represented West Bromwich Albion, Burton, Lewes, Cambridge United, Corby, Solihull and Hednesford in an illustrious career. Special congratulations must go to goalkeeper Tom Parsons, who is just starting his football career and has been promoted to the first team squad. Tom will train with the first team to gain valuable experience and work with the goalkeeping coaches and first-team ’keepers as part of his football education. Central midfielder Rahis Nabi has joined from Burnley under-23s, having played for West Bromwich Albion under-18s. Rahis has also experienced international football having represented England at under-17. AFC are delighted to have re-signed attacking midfielder Lee Chilton, who started his career at Lye Meadow in 2002 before moving on to Leamington. Lee has played at the higher level of non-league football, at Halesowen, Stourbridge, Telford and Stafford, and in 2007/08 he was the Midland Football Alliance Player of the Year. Lee has already proved a vital addition to the squad, being voted player of the month for December. Influential centre back Mark Smith has left Lye Meadow and joined Stourport Swifts. Mark played a major part in Alvechurch’s success over the past four years, winning both promotions and cups with the Lye Meadow side, and will be a major addition to the Stourport squad. 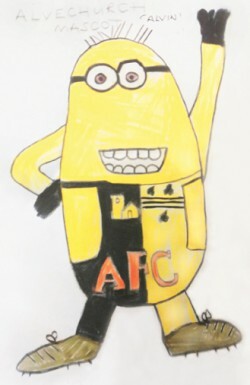 * Congratulations to eight-year-old Harvey Rose for winning Alvechurch FC’s recent competition to design a mascot the club, with his winning design, “Alvin” (right). The competition was judged by chairman Richard Thorndike and manager Ian Long The club would like to thank everyone who entered.